For now I need a lite help, I need to do some test more in this script whit diferent backups if some body can help and send some backupwhit out sensible data, just backups from user account whit some domains, subdominios, databases etc whit no real information will help a lot. -Restore full User level account. -Restore domains and web site files. -Restore databases, mysql user and passwords. 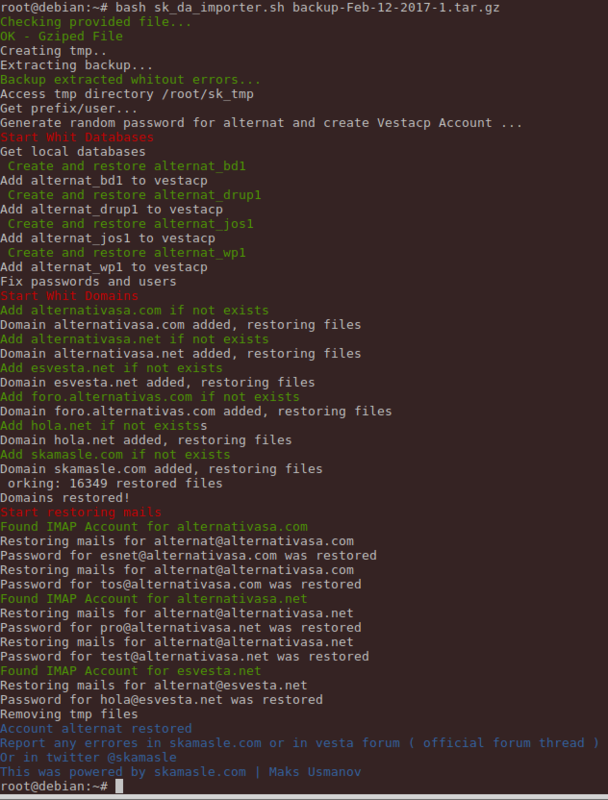 -Restore Mails accounts whit mail passwords. - Restore subdomains -> I not know how subdomains work in DA because I only have backups from DA whit domains, there is no subdomain options in my DA backups so, I Think script need some lines of code to fix this and I will add it when I get new backups whit more content. -Crons, SSL and some orther features will be added later. Last edited by skamasle on Wed Feb 15, 2017 7:25 pm, edited 1 time in total. This is alpha, report any problem here. This script works as described. I changed sk_get_dom to 2. I've been struggling with this script for some time now as the migration didn't complete. I've looked in de script and found that the imap function is looking for accounts in the backup folder. After some searching I found an easy solution. Create your user backups which will include the imap accounts in the backup folder of the tar. Now the importer works fine for normal user accounts. If you have full backup type not supported by this script you can sendme it and when I get some time I will add support for it. From DA website. direct_imap_backup is feature works as below. When enabled, this feature will store the "imap" folder directly into the tar.gz backup file, saving the need to first copy all emails to an assembly area. This should greatly speed up the backup process. For security reasons, the extraction is done as user:user, and not user:mail. Then a secure recursive chown is done whereby it temporarily renames each file to a random value, checks for hardlinks, and checks for user:user ownership. If all passes, it's then lchown, and renamed back. but there can also be a race condition where the client creates the hardlink after the check in DA is done, but before the chown happens, hence we need to rename the file to prevent that, as the client won't be able to predict the filename. Currently, only /home/user/imap is done this way. I have a DA backup if you tell me how you want it I will send you one. hope this script will be update ASAP.